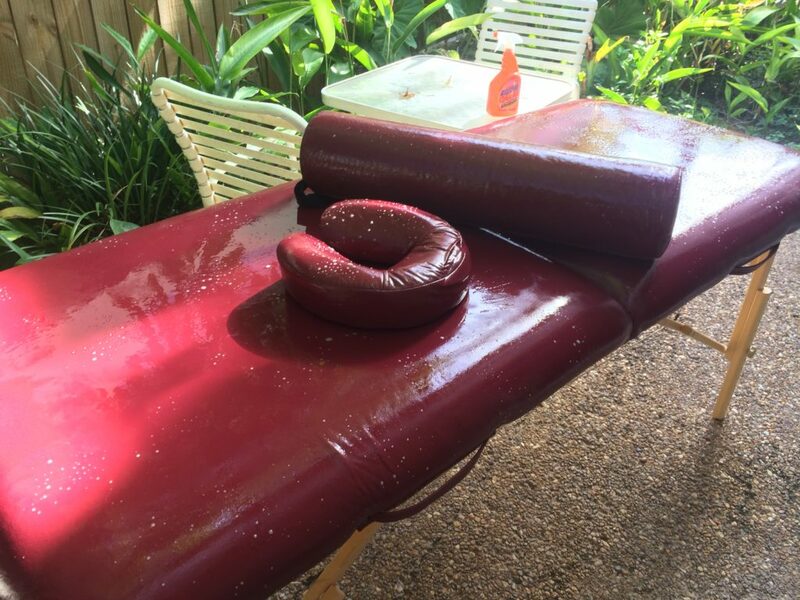 Sometimes a massage table needs a body scrub (and a bath) too! 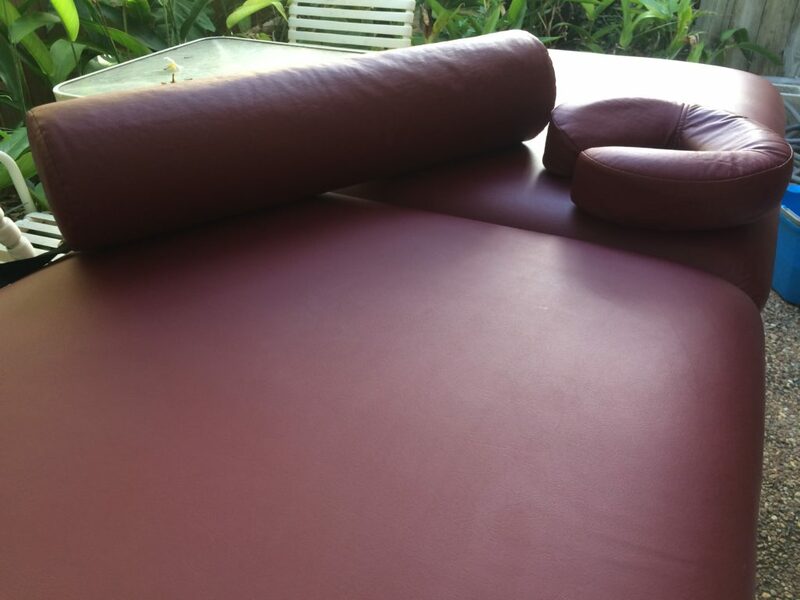 My original Earthlite Spirit massage table from 2002 sat too long in its carry case. Over time the vinyl oozed a very sticky film over the entire surface that plain soap couldn’t remove. 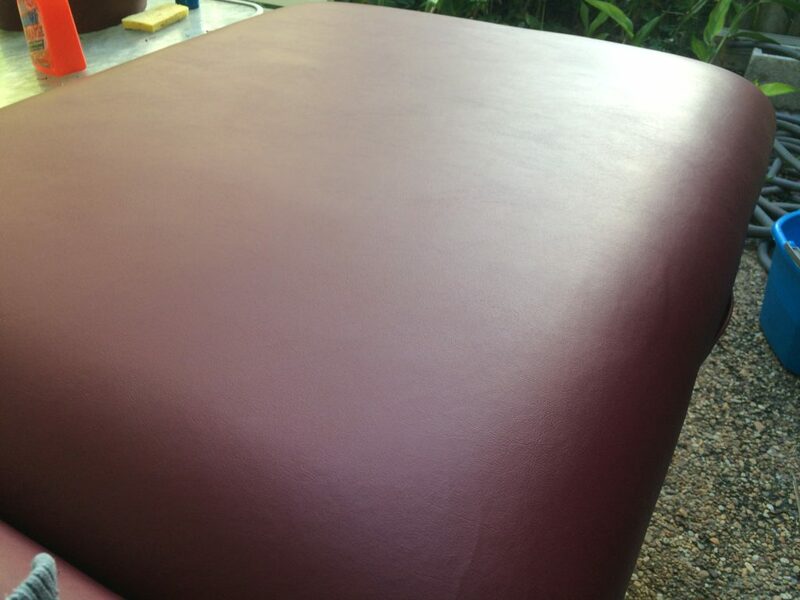 I seem to have figured out a simple and inexpensive way to clean a massage table that has become sticky from old vinyl – hopefully this can help anyone else who encounters a similar situation! (Please remember to test any cleaning products on a small inconspicuous area if you have not used them on your table before to make sure it does not damage yours)! 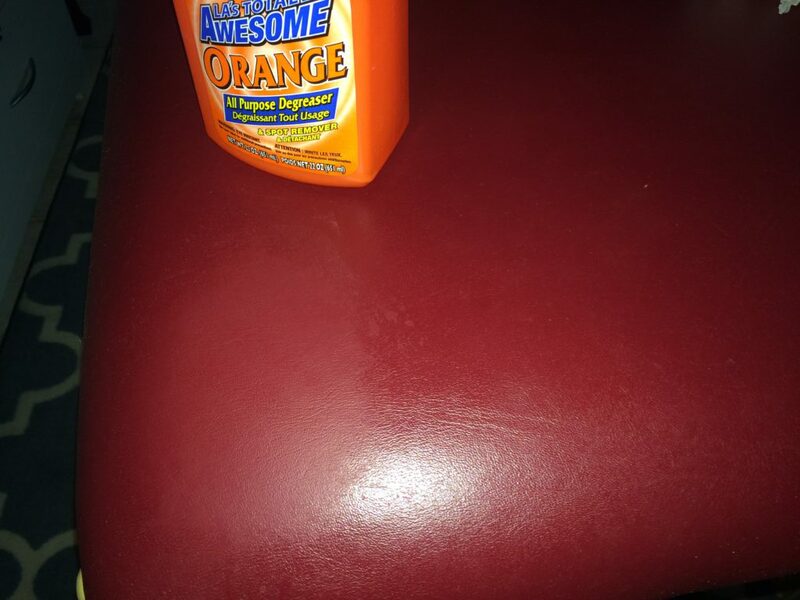 I picked up a simple degreaser solution spray from the dollar store called LA’s Totally Awesome Orange. (This one is pretty mild and well diluted I assume. I would not recommend industrial strength degreasers). In this closeup photo you can see the corner where I tested the degreaser next to the sticky part which covered every square inch of the vinyl, including on my bolster and the face rest. Like night and day! Off to a promising start! In this photo below, the table is now covered with the degreaser solution. (I decided to work outside to avoid making a mess on the floor). I let it sit for a few minutes to let the solvents go to work. I decided to use a common kitchen sponge with a non-abrasive scrubbing surface on one side to help scrub the massage table clean. (IMPORTANT: If you only use the soft side of the sponge you may not get the best results, as someone who recently tried this method explained to me. It was necessary for me to carefully use the scrubbing side – that green part attached to the opposite side of the normal yellow Scotch kitchen sponge which you can see in one of the photos below. Just make sure whatever you use is marked as non-abrasive and test it on a small area first to make sure it doesn’t scratch. Also don’t scrub too deeply to avoid possible damage to the vinyl – gentle pressure should be sufficient). Then I wiped it off with a damp cloth. I saw there was still some sticky residue and a few missed spots (that sticky stuff is stubborn!) so I repeated this step with the degreaser. 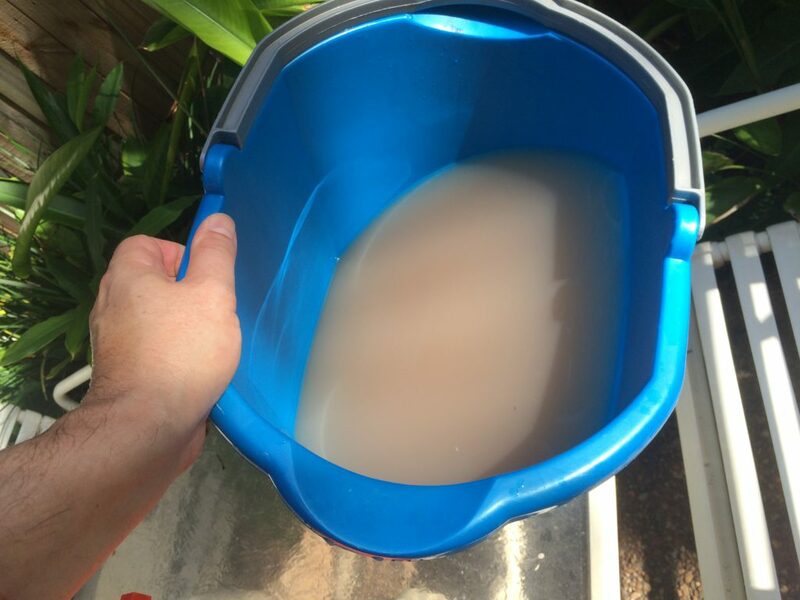 Check out the gross dirty water in this bucket that came out of the sponge after cleaning with the degreaser! I’m not sure where all of that came from, but I’m glad it’s not on the table anymore! 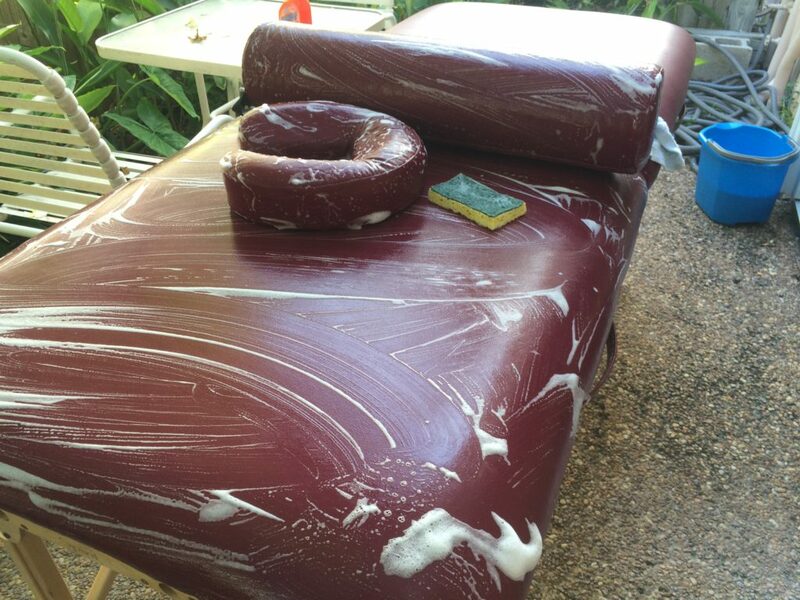 The massage table still had some streaks and did not look clean, so I took some mild dish soap mixed with water in a spray bottle and gave the whole table a nice sponge bath. I tried to avoid getting any of the water and cleaners on the wood parts or inside seams as much as possible. After cleaning it with the soap, I wiped it down with a damp cloth and let it dry in the sun for a few minutes. Look at the results! The surface now looks and feels like the day I bought it 14 years ago!! It was a messy job but well worth the effort! I hope this might help someone to restore an old table like I did mine! It also goes to show that it’s worth spending a few extra dollars on a quality table such as an Earthlite. If you enjoyed this blog, please share it on Facebook, Twitter, or link to it from your own blog!